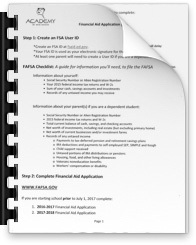 To apply for financial aid, visit the FAFSA website. AHD financial aid representatives will help you find the options available to you. Students enrolled at AHD are eligible to apply for Federal Assistance through Title IV, of the higher education act, which includes Federal Grants (which do not have to be repaid) and low-cost (interest) Federal Loans (with payments beginning 6 months after you graduate). Our professional staff can help determine if you qualify. There are many affordable ways to finance your future. Let us help you. If there is a will, there is a way! A Grant is a need based payment made to help support a students education. Usually awarded on the basis of academic or financial need. Pell Grants are the foundation of federal student financial assistance to which aid from other federal and non-federal sources might be added. These grants are generally awarded to undergraduate students. Unlike loans, grants are not repaid unless you withdraw from school. The amount of your federal grant is based on factors such as age, attendance, family contribution, full or half time and your academic year. For more information on Grants, visit the FAFSA website.